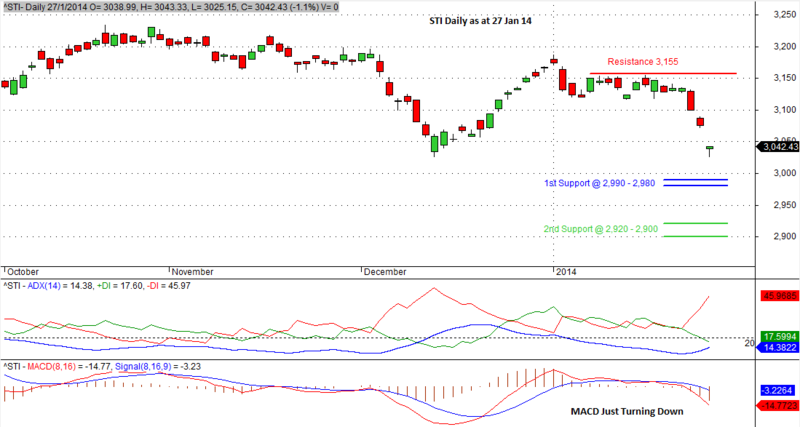 Posted on 27/01/2014 by Jayson	in Markets Comments and tagged Candlestick Patterns, MACD, STI. As mentioned in my Dec 13’s post, STI resistance was 3,200. The index had reached its high of 3,187 on 2 Jan 2014 due to window dressing and thereafter made its way down. The 2 gaps formed in the last 2 trading days as well as its candlestick pattern showed the fierceness of the descent. MACD showed rejection at zero and just started to turn down. This confirmed that STI has begun its momentum down and more to come. There exist a strong support at 2,990 and 2,980. This is also a psychological barrier level and we are likely to see some market reaction either with a rebound or a sideway pattern before moving on to its new direction. If this level can’t hold, we are looking at the next support at 2,920 – 2,900. Going to 2,900 is rather remote but it has happened before during extreme market conditions. With the Lunar New Year around the corner, there will be less volume and traders will be extra cautious with many considering to liquidate their positions. Monday (27 Jan)’s closing saw STI dived to 3,025, which coincided with a recent low in mid Dec 13 prior to the window dressing. There will some reaction here and indeed on Tuesday (28 Jan), we saw price bumped up to 3,062. But looking at the momentum, the outlook is not positive.The new resistance is at the region of 3,155.